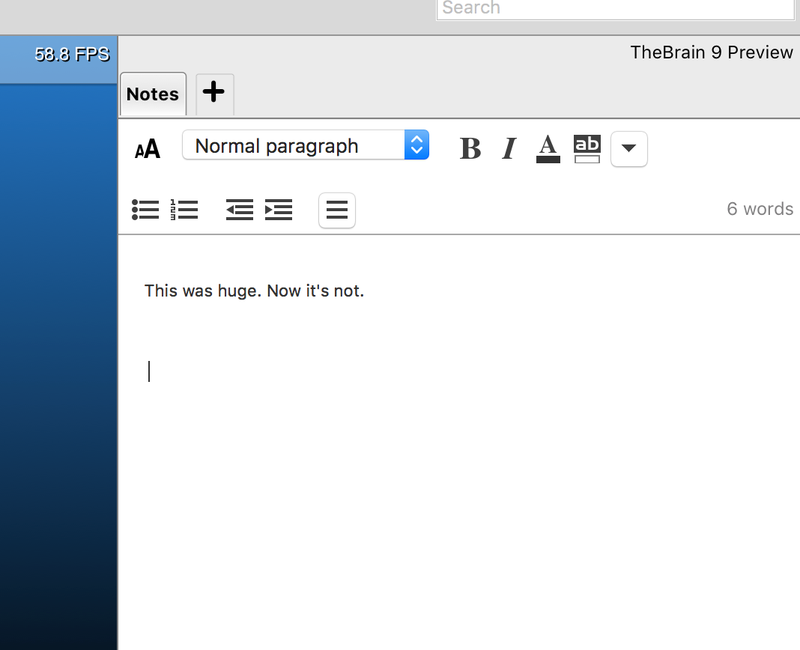 With the layout showing Notes at the bottom, Note text in "Normal paragraph" format are displayed larger than expected. When I switch to the side-by-side layout they return to normal. See attached. This happens with both imported, existing brains and those created using TheBrain 9. Yup, adjusting the font size will help, but when you switch to vertical view it will then be very small. Looks like it's getting it's size settings from the horizontal real-estate. Zenrain is right. The notes are implemented using "responsive design", which essentially means that they adjust to the available width. When you make the notes area very wide, the notes will be much larger than if the notes are narrow. This keeps the number of words per line similar, which is easier to read. It also is useful for usability on various screen sized devices. So on a very small screen, like a phone, the type is VERY small and on a large screen like 22" the type is HUGE. To be honest, I have one other app that behaves the same way and it's very annoying. Well, I'm not sure everyone will agree, but the philosophy goes something like this: Text is ideally read in columns... Once you get beyond 8" or so, it becomes difficult for your eye to track back to the next line when you read the end of one line. Therefore, the wider the text, the larger each line should be. 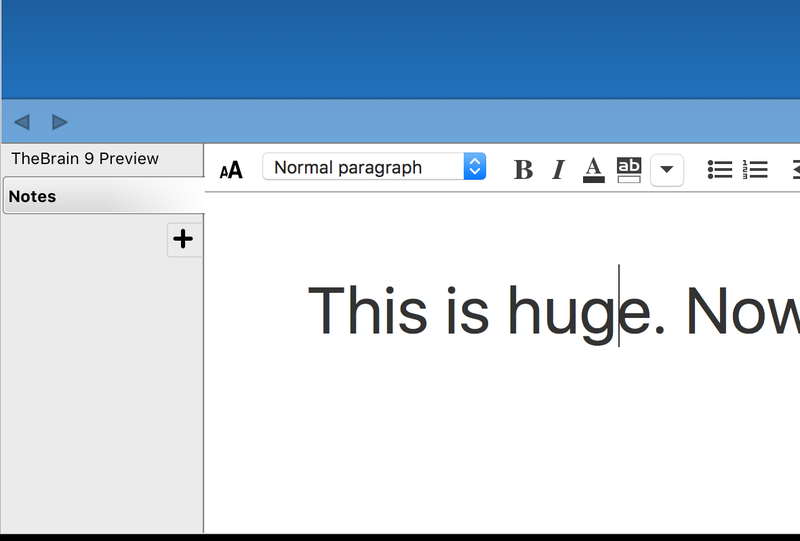 Basically, the notes area is not meant to be used at the full width of a 22" screen, just like your word processor will not let you use the full width of the screen. Currently, the default behavior is to scale the text without enforcing a maximum width. Perhaps an improvement would be to add margins on the left and/or right so that the notes area does not get any wider than 10" or so. In the meantime, when TheBrain window is maximized on a large screen, I would suggest you use the vertically split layout. If you must use the horizontally split layout, you can adjust the width of the notes area by dragging the splitter between the notes and the side tabs (where the attachments are listed). This issue has been logged. Thanks Harlan. I think the "responsive" concept is sound, but the edge cases could use some thought. Certainly not a deal-breaker. I like the idea of a maximum size then adding margins where appropriate.